Few days back i brought milk powder tin and made gulab jamuns but didn't get the jamuns properly and i didn't had courage to make them again.As milk powder was nearing expiry i remembered my neighbour used to bake cake with milk powder.I checked for the recipe in my book and got the below recipe.The cake was very soft and tasty.It had the taste of milk,dry fruits and vanilla and got over within a day of preparing it. Add dry fruits,oil and milk to the dry ingredients. Line a baking tin with butter and sprinkle flour. Pour the batter in the tin and bake in a preheated Microwave oven at 180 degrees for 40-50 minutes or until the sewer when inserted comes out clean. 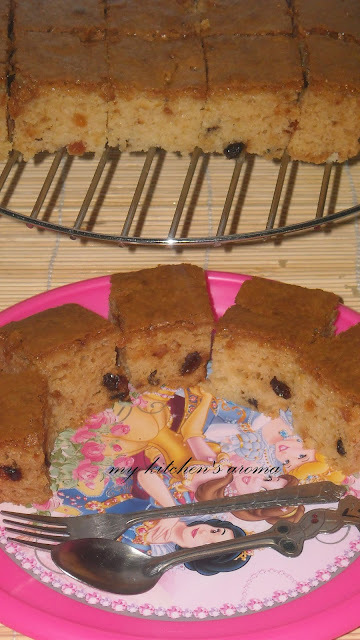 This eggless cake looks soft...yummy.Oil is 1 cup or 1/4 cup?How much to use,i mean comes out good? Lovely cake like the idea of using milk powder. That's a nice and different recipe. I'm definitely trying this, one of these days. Slurp! Lovely cake! That too with milk powder and eggless, it looks awesome and tasty! Wow....cake looks soft and yummy. Beautiful and deliicous looking cake. I love cakes like this, it always reminds me of home. googled for milk powder cake as I wanted to use up the powder lying here, got you link. Made this today. Excellent recipe. Thanks a lot for sharing..
Iam vegeterian. Can u please send your eggless cakes recipes on my mail adress, because i can not copy this. 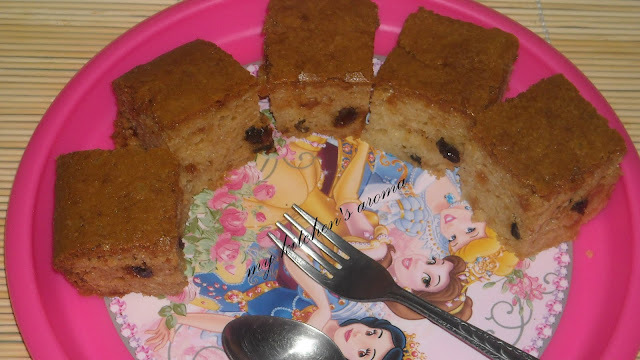 I tried out your Eggless cake with milk powder and it turned out to be super duper hit.. very soft and fluffy..
here is the picture of the cake..
hi tried your cake came out good,thanks for sharing .i was searching for the eggless cake recipe and also wanted to use my milkpowder lying in the closet and your recipe just came across.i tried many eggless cake this one was very good .i also want some tips to make cake more moist.thankyou once again,mine blog is also there i have posted this one too giving your reference. Thanks sowmya for trying this cake and thanks again for taking time to letting me know how much you liked it. I baked my cake in my microwave (convention and combination) oven.The temp varies from oven to oven.I think in your case you over baked the cake. And i didnt use butter,i used canola oil and i mentioned that quantity can be reduced according to once preference. thanks 4 wonderful recipe. i prepared this cake atleast 10 times from last month. my child n hubby loves the cake. everybody apprecited this cake. once again thanks. thanks 4 wonderful recipe. made this cake atleast 10 times since 1 month. my hubby n child loves this cake. everybody in the family appreciated. once again thanks. I made this cake and it's awesome! 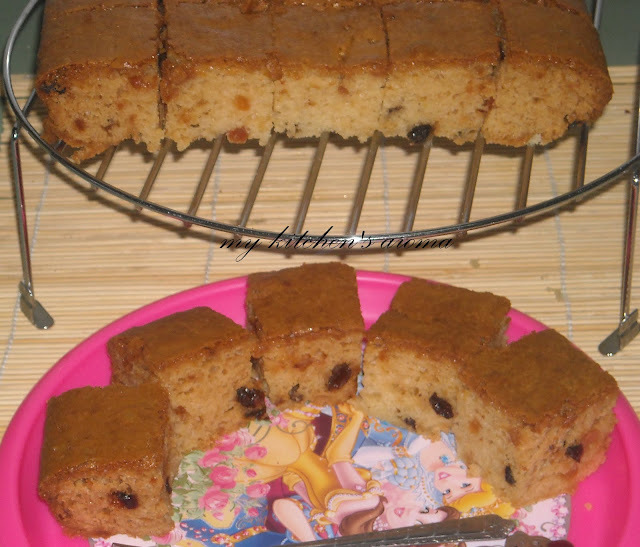 I love milk so I really liked the richness of the taste..Sugar can be reduced too because I find milk powder quite sweet on its own..
Hi I tried this cake , but I baked it in pressure cooker and it really come out very well n tasty. Hi,i liked this recipe very much.i want to try it out.can we use skimmed milk powder for this?